"OK, this should be fun." Hands are rubbed together excitedly. It's a rear-wheel-drive sport coupe painted candy apple red. It's sleek, slinky, and uniquely styled. 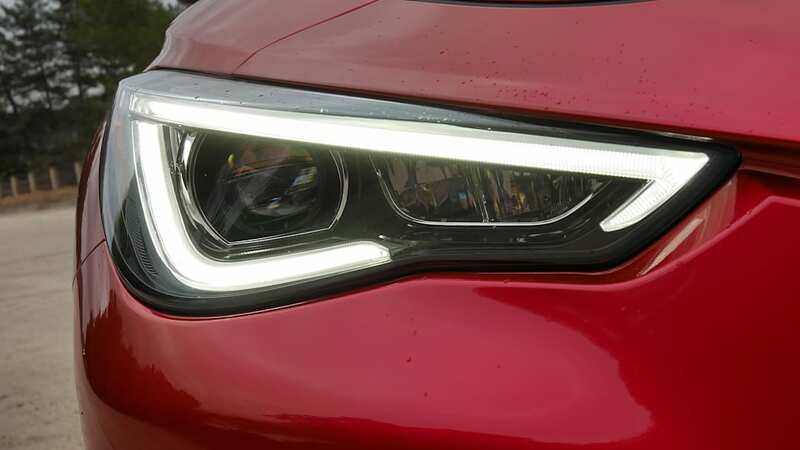 It's from the same folks who, in the 2000s, finally showed that BMW could be matched in the whole sport sedan/coupe game. Oh, and it has 400 horsepower. Four-hundred! With a four. 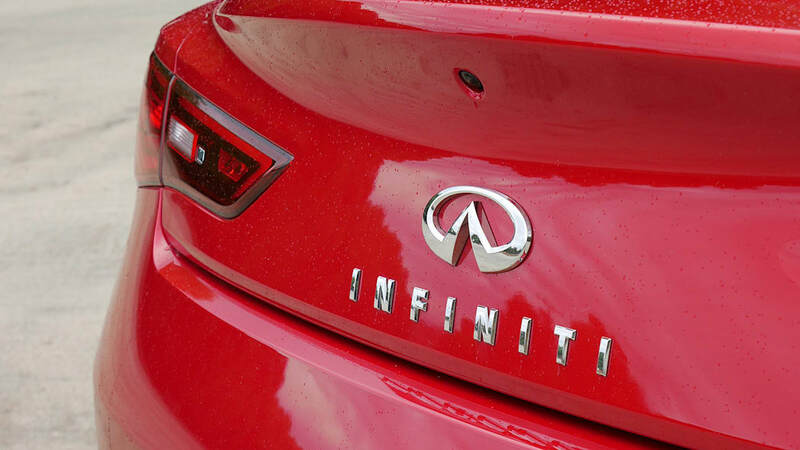 And yet the 2017 Infiniti Q60 underwhelms. What looks so good on paper instead is rather conflicted, stuck somewhere in no-man's land between the traditional expectations of a performance sport coupe and those of comfier, more luxurious cruisers that isolate and pamper their occupants. It's a serious effort with serious engineering and a clear desire to be innovative, but at least in the range-topping Red Sport model we tested, it fails to come together in a way that truly excites or indulges. A great coupe should do one or the other, and ideally both. To explain, let's start under the hood, where Infiniti's all-new "VR" series 3.0-liter twin-turbo V6 makes its second appearance after debuting in the Q60's four-door sibling, the Q50. 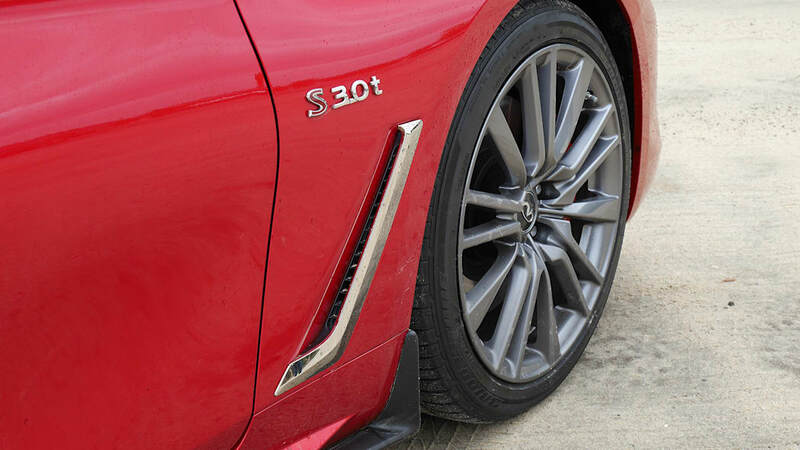 In the Q60 Silver Sport model, it produces 300 horsepower and 295 pound-feet of torque courtesy a pair of turbochargers that create 8.7 psi of boost. In the Red Sport, the knob is turned up to 14.7 psi, resulting in the oh-so-salivatory magic number of 400 hp along with 350 lb-ft of torque. A device known as an optical turbo speed sensor, special to the Red Sport, manages and maintains that extra boost, while an electric motor fitted to the valve timing system serves to quell any loss in throttle response due to forced induction. 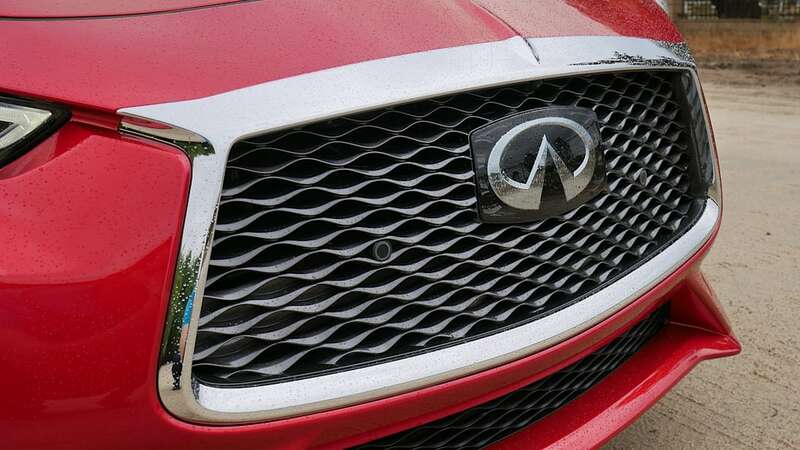 The Red also gets a second water-cooled intercooler, which, in both models, is distinctive for its more compact size, shorter airflow path, and, according to Infiniti, a resulting reduction in turbo lag and more immediate engine response. 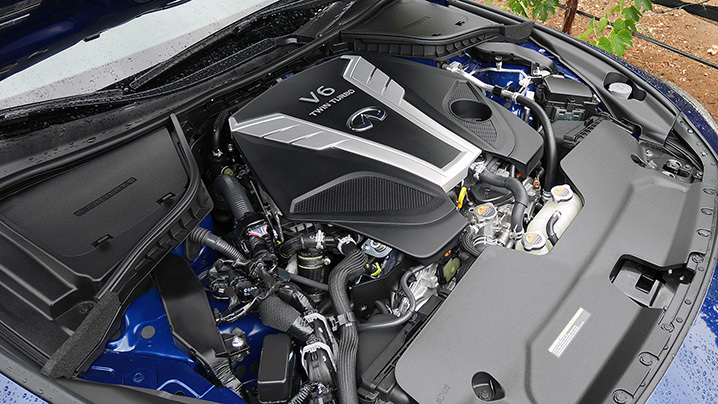 It's certainly a clear improvement on the somewhat rough 3.7-liter "VQ" V6 it replaces, which increasingly felt and sounded a little out of place in a luxury car. The new VR30DDTT, as it's so eloquently named, is buttery smooth and indeed responsive, likely capable of convincing luxury-car owners used to naturally aspirated V6s that everything's business as usual. Honestly, its character is reminiscent of a silky Honda V6. In some respects, that's a great thing. 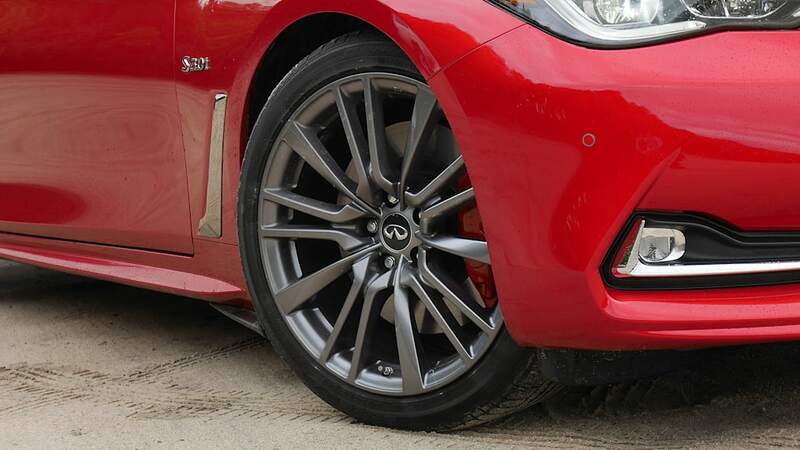 In others, it's where the Q60 starts to fall flat. 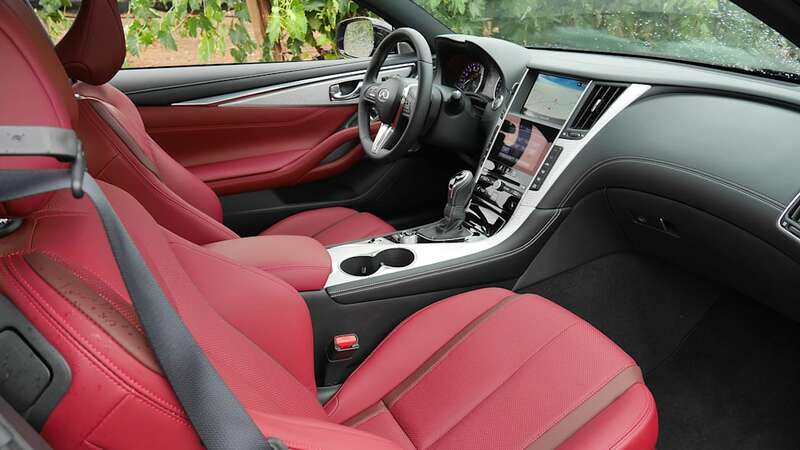 Pin the throttle and the Red Sport shoots forward without much fuss – there's a subdued engine note with a tiny bit of Nissan GT-R jet-like whir, but it's just too quiet and not especially exciting. 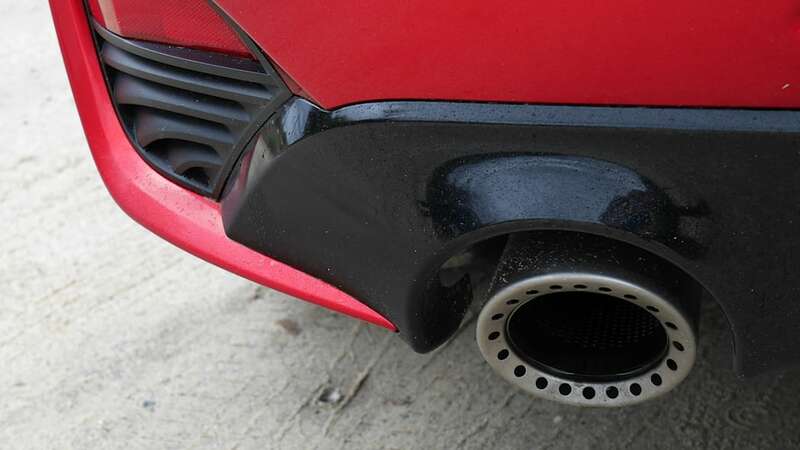 There is virtually no exhaust noise, which is all the more disappointing since the original G35 and its distinctive exhaust could be identified a mile away. 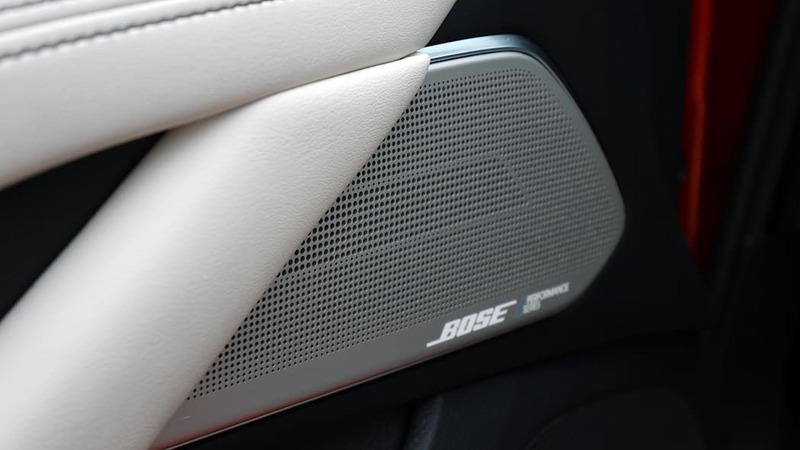 We're not suggesting Infiniti adopt a wake-the-neighbors Jaguar F-Type sound here, but when a sport coupe has 400 hp, there should be some more audio to drive home the point. Even the acceleration is uninspired. 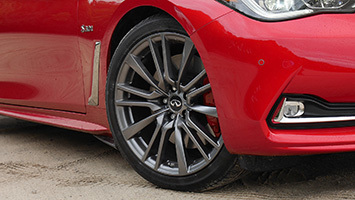 Infiniti estimates the Q60 Red Sport AWD will sprint from 0 to 62 mph in 5 seconds flat. If so, that's a bit slower than the BMW 440i that produces only 320 hp and 332 lb-ft of torque. So what's going on? Well, the Red Sport does weigh about 200 pounds more, at 3,862 pounds, but it doesn't seem like that should make that much of a difference. 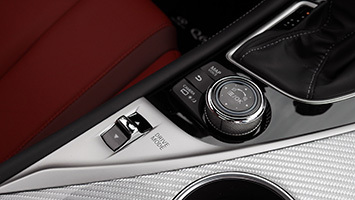 Maybe it's the response or gearing of the seven-speed automatic transmission versus BMW's eight-speed? 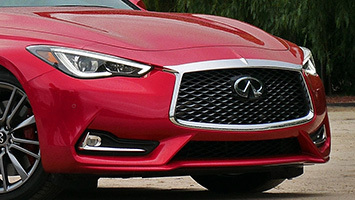 Somewhere, the Q60 loses pace and even before we started crunching the above numbers, the Red Sport just didn't feel like a car with 400 hp. Yes, it's still very quick, and the lack of auditory exuberance certainly doesn't help, but this doesn't feel like a car with a power figure theoretically closer to BMW M and Mercedes-AMG models than their more pedestrian siblings. 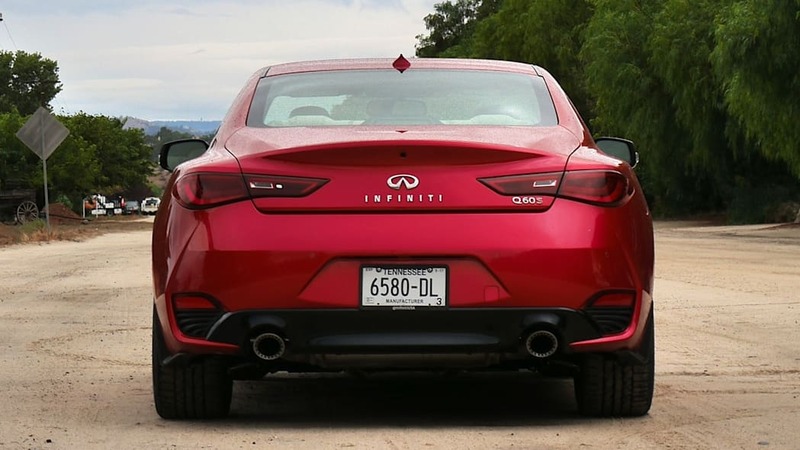 There was no Silver Sport to sample and Infiniti didn't release a 0–60 estimate for that variant, but it stands to reason that the same car with 100 fewer horsepower will also disappoint in such metrics. 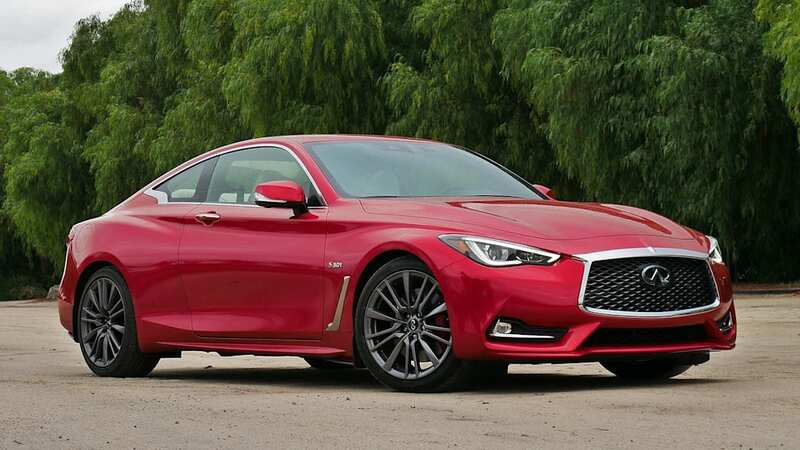 The base Q60 2.0t, also not on hand, won't have the same high-performance expectations, but its Mercedes-sourced turbo inline-four (208 hp, 258 lb-ft) is estimated to get it to 60 in 7.3 seconds – that's at least a second off the competition. Fuel economy stands at an EPA-estimated 22 mpg combined with either V6 (RWD), while the 2.0t returns 25 mpg combined. 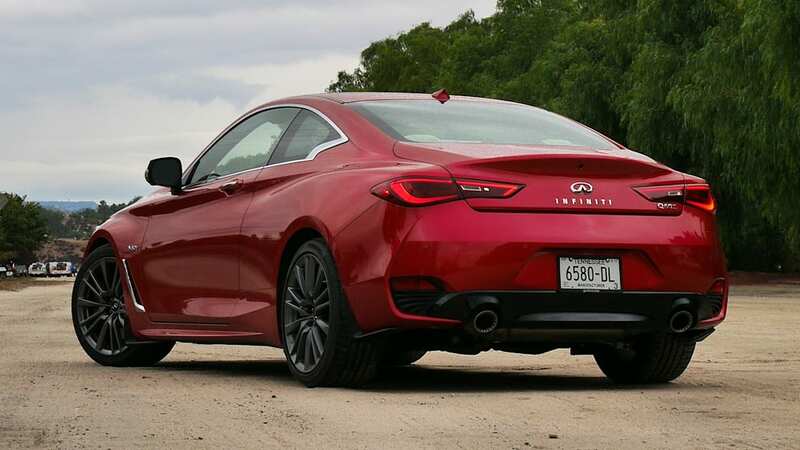 Of course, the 2017 Infiniti Q60 is also a luxury coupe, and if identified as such, spine-crunching acceleration and ear-drum-tickling exhausts aren't a necessity. Nobody complains that a Mercedes S-Class is too quiet – serenity is entirely the point. 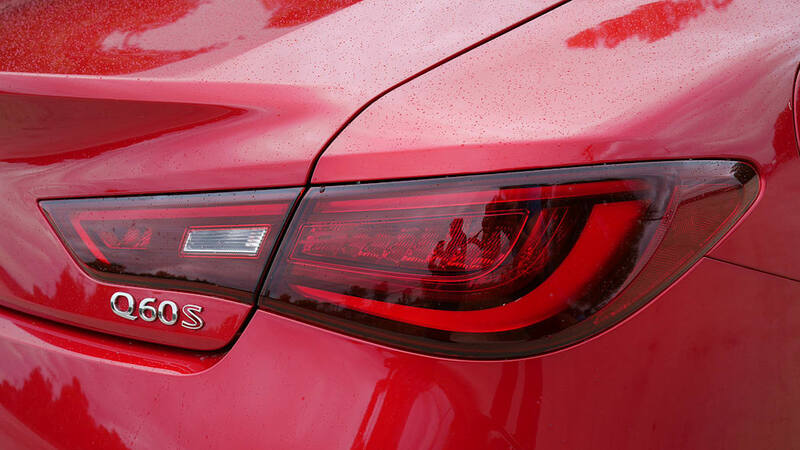 A car that nonchalantly delivers the sort of smooth, effortless power as the Red Sport does certainly has some appeal. 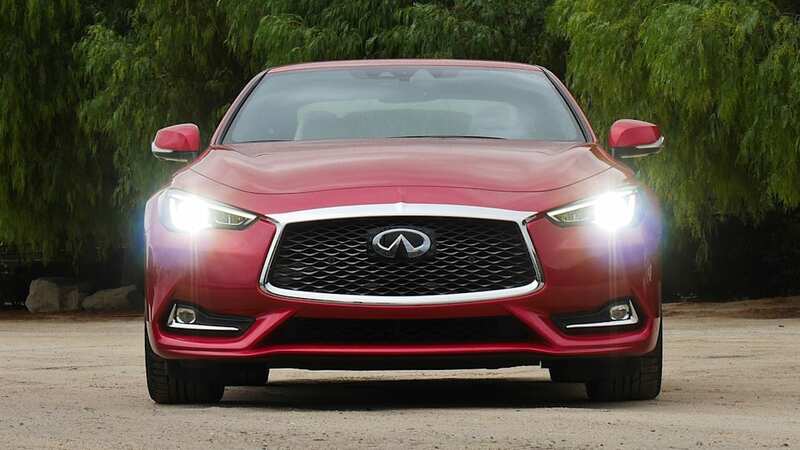 However, such a luxury car should probably deliver a magic carpet ride, and the Q60 does not. Here, too, it falls outside the realms of sporting and luxurious coupes. Yes, the Silver and Red Sports come standard with an adaptive suspension offering Standard and Sport settings, but the differences between the two are too subtle and the Standard mode skews toward the firmer end of the spectrum. The ride was at times a bit jittery over rough stretches of pavement during our test drive in San Diego County, California, and a BMW 440i seems suppler. Perhaps spacing those two settings apart, much as Porsche recently did with its adaptive suspension in the 911 and 718, could be a solution. Ah, but what of handling? Having a pair of firmer suspension settings does result in impressive body control, and we were able to easily maintain a rapid pace, but the steering betrays the cause. More accurately, both steering choices do (and we didn't even get the chance to test the third, the hydraulic-assist setup in the 2.0t). 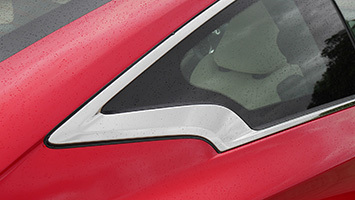 The standard electric power steering system is perfectly acceptable – it features an electric motor on the rack and a direct mechanical connection to the steering wheel. It feels reasonably natural, with consistent weighting and even some feedback, but it doesn't really inspire you to drive in a way befitting a performance-oriented car. Perhaps this is unfair given that the supposed performance benchmark, the BMW 4 Series, is far from superlative in this regard. 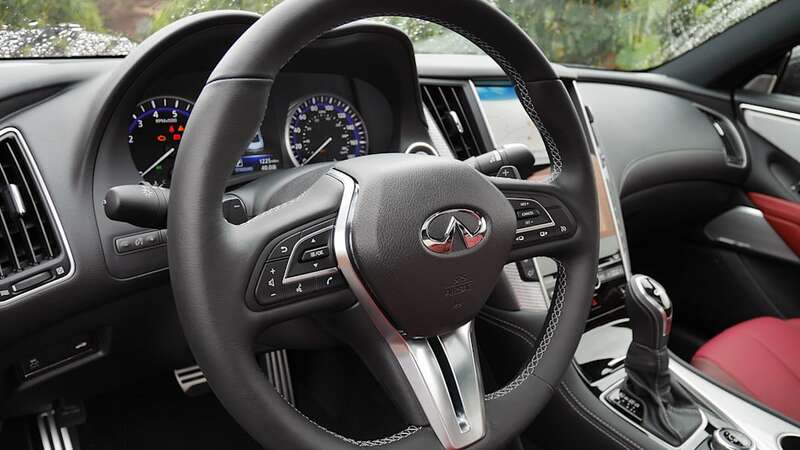 Then there's Infiniti's re-tuned Direct Adaptive Steering system, the steer-by-wire system with no mechanical connection between rack and steering wheel apart from an emergency backup. The difference between it and the standard EPS is immediately noticeable, with quicker turn-in at lower speeds (that can actually be made quicker) and an odd, disconnected feel at times resulting from the fact that the wheels can make small inputs and corrections your hands did not tell them to do. 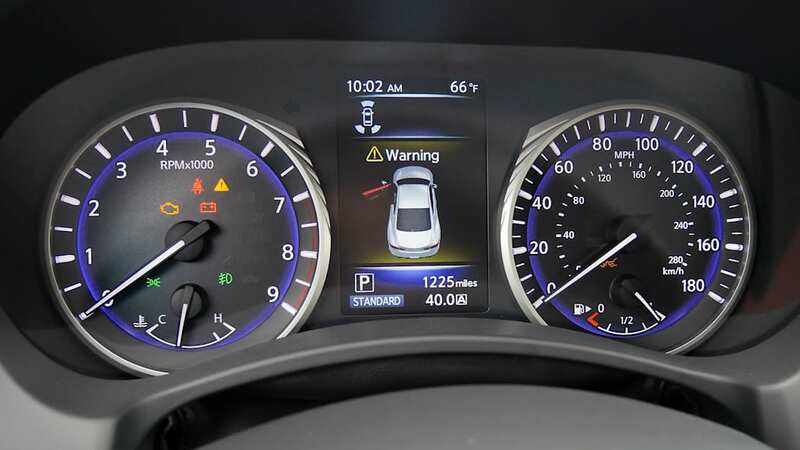 This sensation now seems to be diminished at higher speeds, but Infiniti appears keener to label DAS as a comfort-oriented and NVH-reducing element rather than a performance-improving one. Because of that, though, it's another incongruous Red Sport element, and we're unsure why someone would plunk down an extra $1,000 to reduce steering wheel vibrations and kick-back (the primary benefit, supposedly) given the perfectly pleasant standard EPS. Apparently, though, there's a 30-to-40-percent take rate for DAS on the Q50. 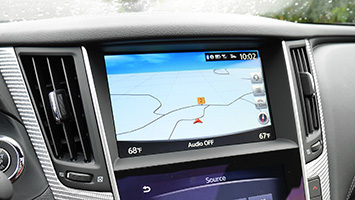 Now, selecting DAS does allow for the complete menu of driving modes, including seven different steering settings to go along with multiple engine/transmission, adaptive suspension, and Active Trace Control settings. In total, there are 336 possible combinations for a driver to concoct in the Personal Drive Mode Selector. Maybe the geekiest among us will appreciate that, but it seems a bit superfluous. All of this is to say that the Infiniti Q60 is dynamically conflicted, but everywhere else it burnishes its luxury coupe credentials quite clearly. Some may see a few too many visual complications (the side gills, the "crescent cut" C-pillar, the little wrinkle above the grille), but its proportions are spot-on and you'd have to be pretty dense to confuse this for a German competitor. It gets attention, and in a good way. The interior is similarly true to its brand identity – it's decidedly modern, tech-focused, and impeccably constructed. The Sport models' "Silver Optic Fiber" trim is an especially cool, distinctive element with an interesting texture that could be even better with a bit less varnish. 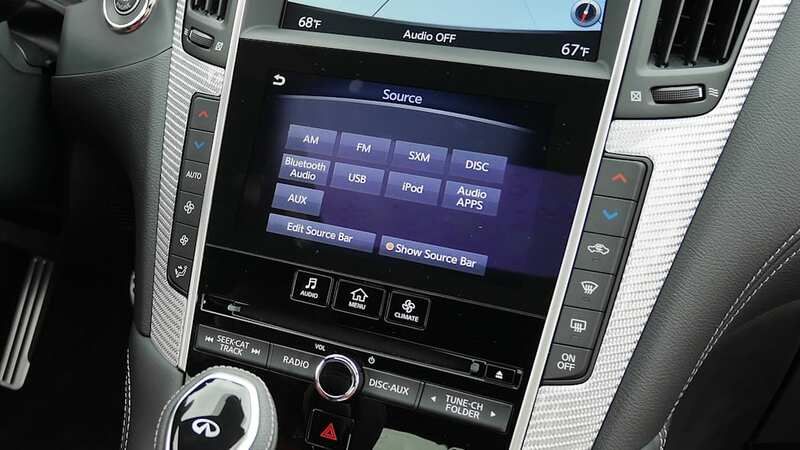 Infiniti's dual-screen tech interface with redundant console controller for the upper, navigation-focused screen is refreshingly easy to use. Unlike Acura's similar system, there's less confusion over which screen does what, and the bordering buttons and knobs are most definitely welcome. 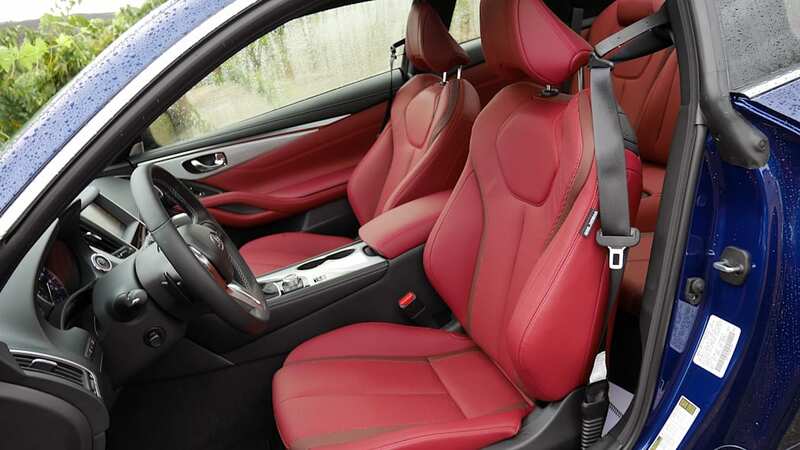 The seats are also superb, specifically designed, according to Infiniti, to match the curvature of the spine and provide consistent support to both upper and lower back muscles. After many hours in the saddle, they remained tremendous, and also offered ample adjustability. 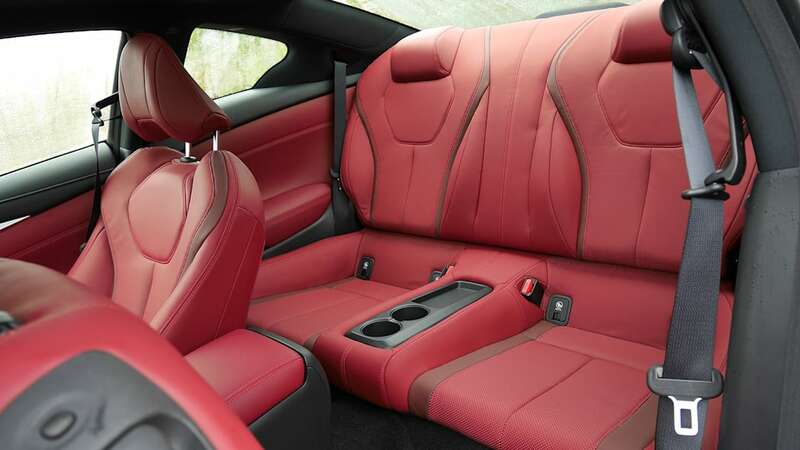 The back seat is less praiseworthy, but someone 5-foot-6 should fit comfortably enough, and that's certainly sufficient for a coupe. 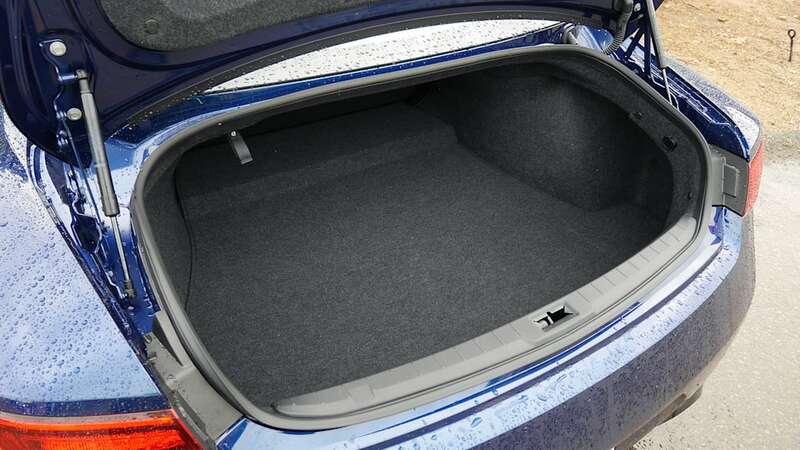 The trunk is similarly of a smallish but typical and perfectly useful size. And finally, there's its value. 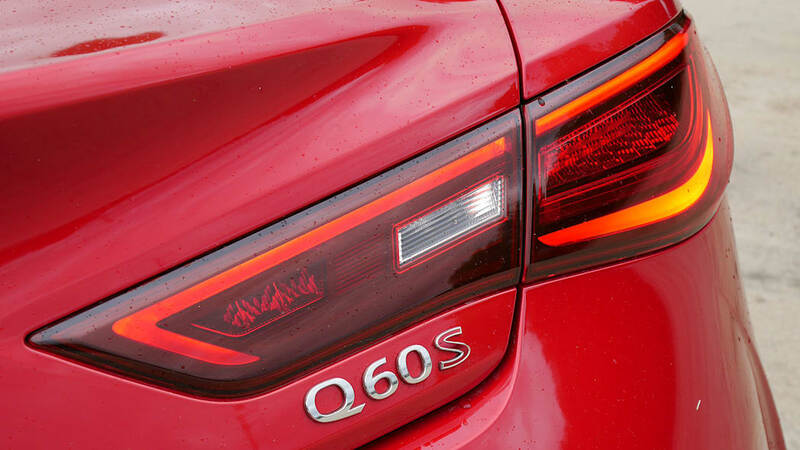 With the $1,000 DAS option, a rear-wheel-drive Q60 packed with all the accident-avoidance and infotainment tech hits the register at $60,355. A similarly loaded BMW 440i would cost about $62,600, and there's not a similarly powered Audi A5, Cadillac ATS, Lexus RC, or Mercedes C-Class Coupe available. Of course, as determined earlier, "similarly powered" is a bit relative. 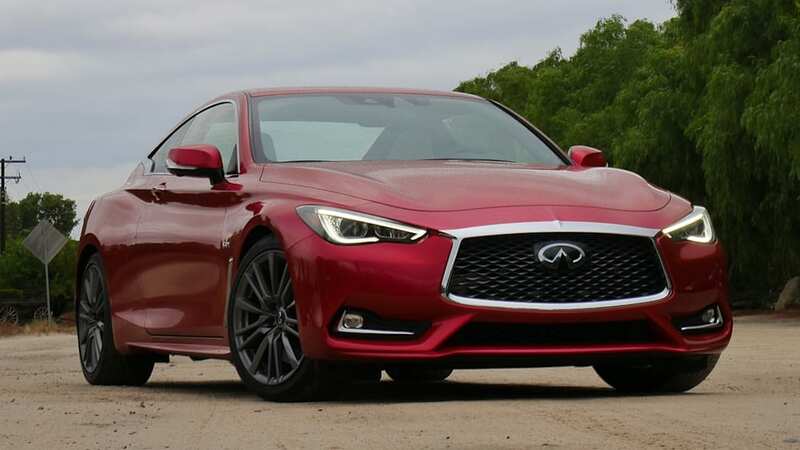 Q60 pricing starts at $38,950 for the 2.0t model, and if performance is less important, it delivers more features for less money than those competitors do. And for $44,300, the 300-hp Silver Sport provides six-cylinder power in a four-cylinder field. 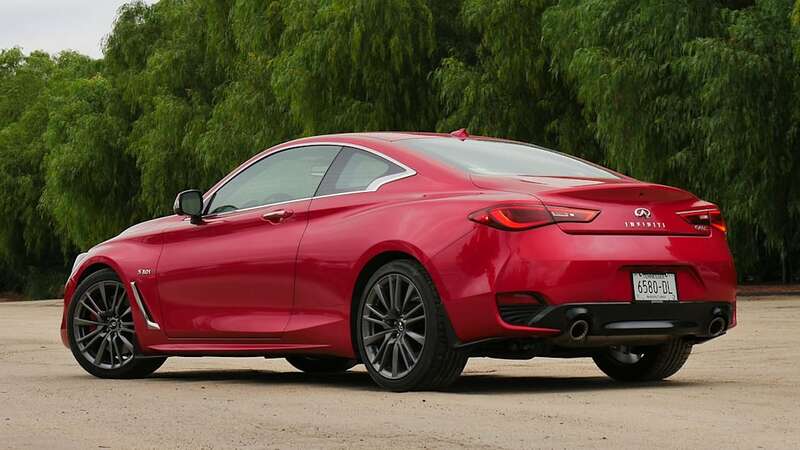 As such, we suspect that the 2017 Infiniti Q60 will be a more compelling coupe on the lower end of its spectrum with greater value to flaunt and fewer performance expectations hanging around its neck. 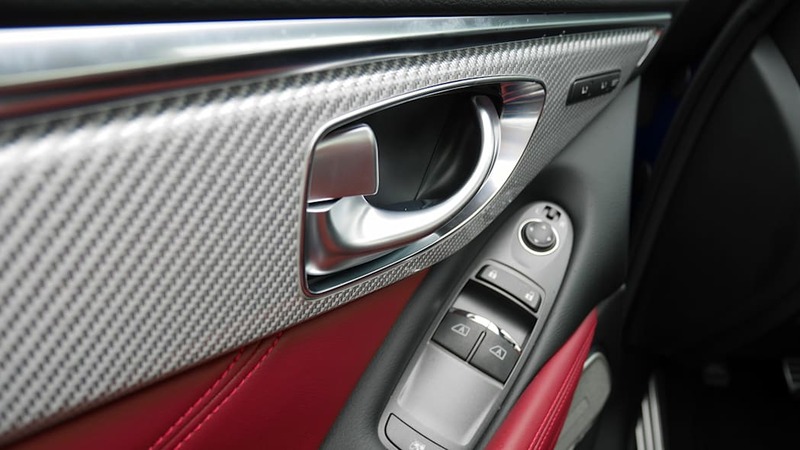 Plus, unlike some other value-oriented luxury cars, it actually strikes an emotional chord with its distinctive styling and interior. We really do like it, but were admittedly expecting more.